South Korea’s government is trying to rein in smoking in the country, but not everyone is ready for change. The number of South Koreans trying to quit smoking has skyrocketed in the wake of the government proposing a large tax hike on tobacco products. Last month, the South Korean government proposed a significant new tax hike on tobacco in an effort to reduce the smoking rate in South Korea, which is among the highest in the developed world. If the tax hike goes into effect, the price of an average pack of cigarettes in South Korea would nearly double, from 2,500 won ($2.32) today to 4,500 won ($4.20) with the new taxes. Although the proposal still needs to be approved by South Korea’s legislature, many smokers in South Korea seem to think it will pass. Indeed, a recent report from the Korean Health Promotion Foundation said the number of South Koreans registering for Public Health Center’s smoking clinics doubled last month, from a monthly average of 1,475 between January and June to 2,873 in September. The report said that the rise was even higher among chain smokers and smokers over the age of 40. The foundation concluded that the government’s proposal already appears to be getting smokers to try to quit, and called on Public Health Centers across the nation to ensure they had the capabilities in place to adequately support these individuals. Besides the price increase, the government’s new proposal would impose new restrictions on how tobacco can be advertised, and require tobacco products to feature warning labels. 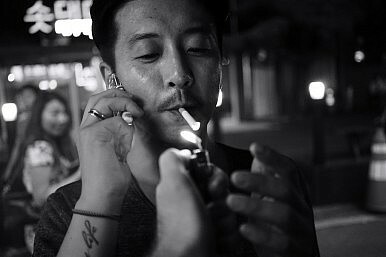 The tax hike is part of the government’s effort to reduce South Korea’s adult male smoking rate to 29 percent by 2020, from about 41 percent today. This is substantially higher than the 26 percent average among all Organization for Economic Cooperation and Development (OECD) countries. South Korea’s overall adult smoking rate is also among the highest of any OECD nation. Still, it’s far from certain the tax hike will be passed as it was met with immediate criticism from both political parties and civic groups. South Korea’s opposition parties, including the New Politics Alliance for Democracy (NPAD,) characterize the proposal as a tax hike dressed up as a public health initiative. Meanwhile, the Korean Smoking Association said the plan would burden ordinary people, quoting its own survey showing that 79 percent of respondents who smoked had said they would continue smoking regardless of the government’s plan. After the government’s plan was released, tobacco sales spiked throughout the country, almost certainly from smokers hoping to stockpile tobacco before prices rise. 7-Eleven said that its South Korean stores had a 59 percent increase in tobacco sales in the first 10 days after the government announced its proposal. If the government’s plan is approved by the National Assembly, the tax hike will go into effect at the start of next year.